Here is a List of Best Free EPS Editor Software for Windows. These freeware to edit EPS file let you apply various changes to EPS files. With these freeware, you can modify existing file or add new objects or effects. These EPS editor software are completely free to use without any limitations. Some let you apply vector editing to EPS files, while some only provide options to apply filter and enhancement effects. Insert text, shapes, tables, Bpictures, cliparts, objects, etc. 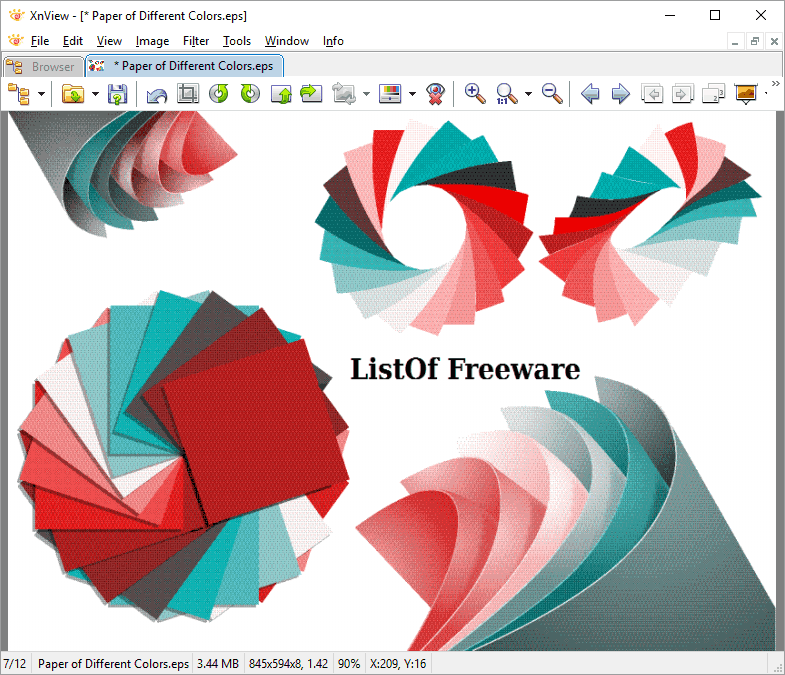 to your file easily with these freeware. Options to add Bezier curve, brush strokes, freehand drawing, eraser, etc. are also available. EPS stands for Encapsulated PostScript. This format may contain both vector and bitmap data. Unlike other formats, image data in EPS is stored as post script and not as pixels. It may contain small images logos, images, maps, or complete layouts. The data can be losslessly zoomed and viewed. EPS format is supported by some famous paid graphic editors, such as: Adobe Acrobat, Adobe Illustrator, CorelDraw, Matlab, etc. But, as we are looking for free EPS editor software, I have tried to summon the list of best free EPS file editor software in this article. Read below to know more about each of them in brief. You will also get to know how to edit EPS files using these freeware. 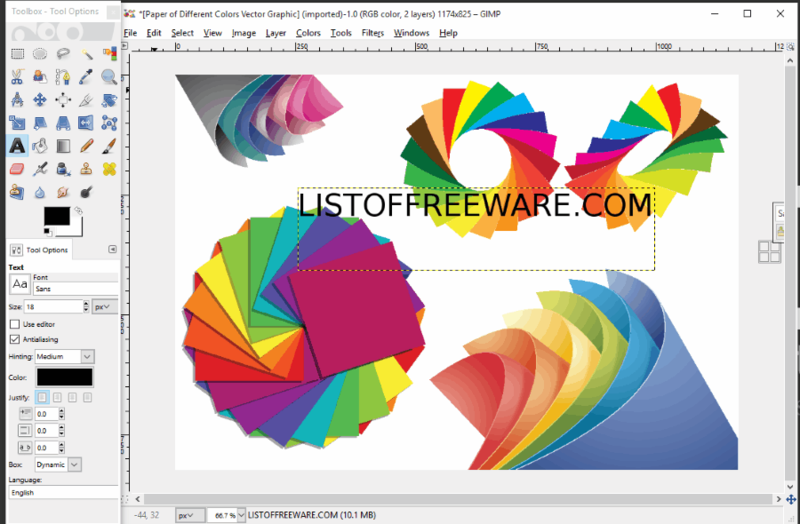 Inkscape is one of the best free graphic editor software to edit EPS files. It gives you the ability to modify vectors and add other bitmap effects. You can also work in Layers with this free EPS editor. Add objects, paths, text, and make various other edits. Moreover, you can also save EPS as EPS. 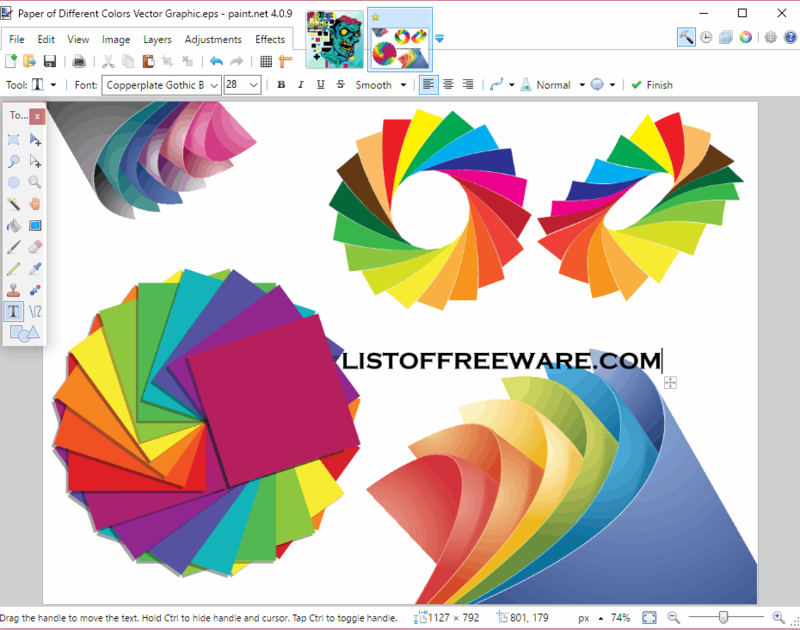 You can also check out these lists of best free EPS Viewer Software, SVG Editor Software, and CDR Editor Software. 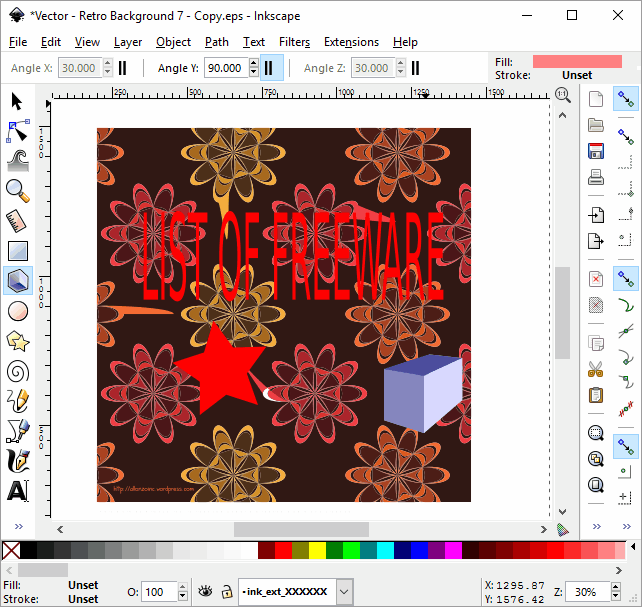 Inkscape is a free vector graphics editor software to edit eps files for free. 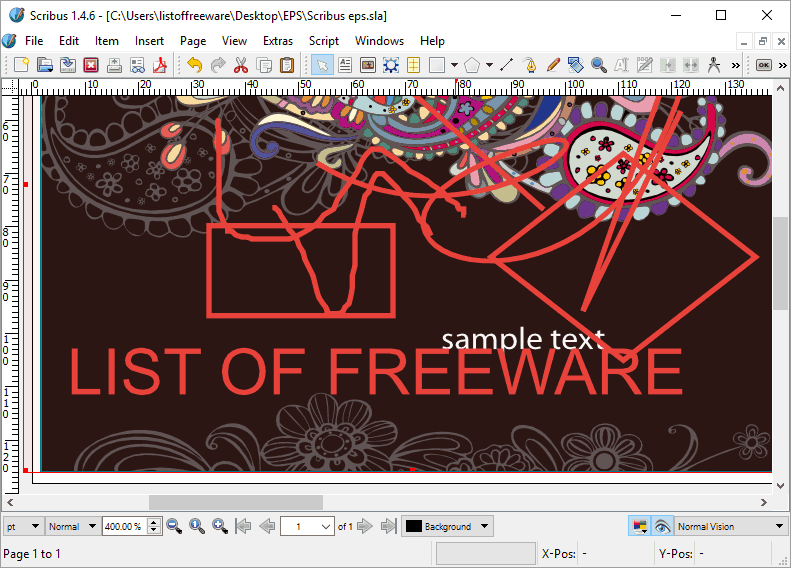 This eps file editor is a famous cross platform freeware for Windows, Linux, and MAC. It has a bunch of tools to let you view and edit EPS files the way you want. It also supports Layers, which is an added advantage over other EPS file editors. Availability of vector editing tools helps a lot with editing EPS files. These tools include: selection tool, edit path by node, insert shape, freehand tool, bezier curve, brush strokes, text, spray, eraser, etc. Object tools: fill and strokes, symbols, group, ungroup, resize, rotate, flip, etc. Text tools: text and fonts, svg font editor, put on path, under flow, and convert to text. Path tools: object/stroke to path, trace bitmap, union, difference, intersection, exclusion, division, combine, simplify, etc. You can save your image as svg, pdf, png, eps, odg, html, zip, etc. You can use this freeware to make some not so common but unique conversions, such as EPS to SVG and EPS to PSD. 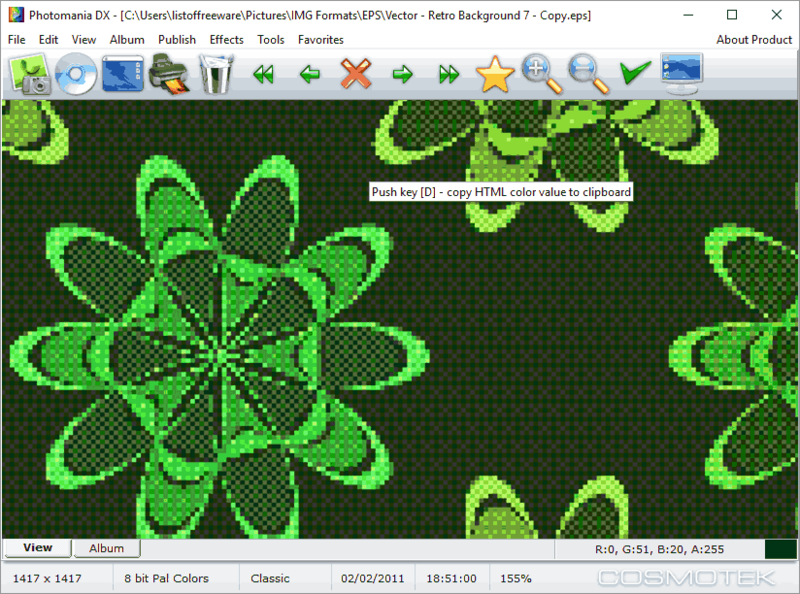 GIMP is an image manipulation software, which does not natively supports EPS files, but can be made to open and edit EPS with the help of Ghostscript. Most users prefer using GIMP as it has a bunch of features and image editing tools. You can add objects to your image, such as: rectangle, circle , free hand drawing, path tool, pencil, blend, text, paint brush, etc. It also supports Layers and has object transformation options. You can apply filter effects to adjust contrast, brightness, saturation, hue, sharpness, etc. You cannot save EPS as EPS, but various other raster image formats. To make GIMP able to open and edit EPS files is pretty easy. All you need to do is follow few simple steps. Go to Ghostscript bin folder. Its usually located under C:\Program Files\gs\gs9.07\bin\ folder. Copy the gsdll64.dll (for 64 bit computers) or gsdll32dll (for 32 bit computers). Now go to Gimp bin folder at C:\Program Files\GIMP 2\bin\ location. Here find the libgs-8.dll file and rename it to libgs-8.old. Paste the gsdll file in this folder and rename it as libgs-8.dll. Restart GIMP to open EPS files in GIMP. Paint.Net is another famous and free software to edit EPS file. It opens raster image files easily, but to open vector files and postscript files, you need to install Ghostscript on your computer, then add few plugins to the Paint.Net installation folder (explained later). Do note that you can open and edit EPS, but can’t save that in EPS format. You can save the edited EPS file in the following formats: pdn, bmp, gif, jpg, png, tiff, tga, dds, etc. Selection tools: Rectangular select, Lasso tool, Ellipse select, Magic wand, and Move selection. Layers: Add new, duplicate, delete, merge , flip, import from file, etc. Transformation tools: Resize, Flip, Rotate, Crop, etc. Adjustment: Autolevel, black and white, curve , saturation, invert color, etc. Insert: Objects, Shapes, Text, Clone, etc. Copy the OptionBasedLibrary vX.X.dll and OptionBasedLibrary vX.X.dlc files to C:\Program Files\Paint.Net\ folder. Copy the ImPS,EPS,AI.Open.FileType.dll and ImPS,EPS,AI.Open.FileType.dlc files to C:\Program Files\Paint.Net\FileTypes folder. Restart Paint.Net to open EPS files. Insert Text, Table, and Image. Insert shapes (rectangle, oval, lines, arrow, flow chart, special symbol, etc.). Bezier curve and Free hand tool. There are various preview modes to view your file after editing: Normal, Protanopia (red), Deuteranopia (green), Tritanopia (blue), and Full Color Blindness. You can apply these modes to an image if you want. There are various image formats that this software support to Open, Save, Import, and Export. Open: .sla, .sla.gz, .scd, .odg, .svg, .eps, .ps, .ai, .pdf etc. Import: .odg, .svg, .eps, .ps, .ai, etc. Export: .eps, .pdf, .svg, image ( .png, .jpg, .tiff, .ico, .bmp), etc. 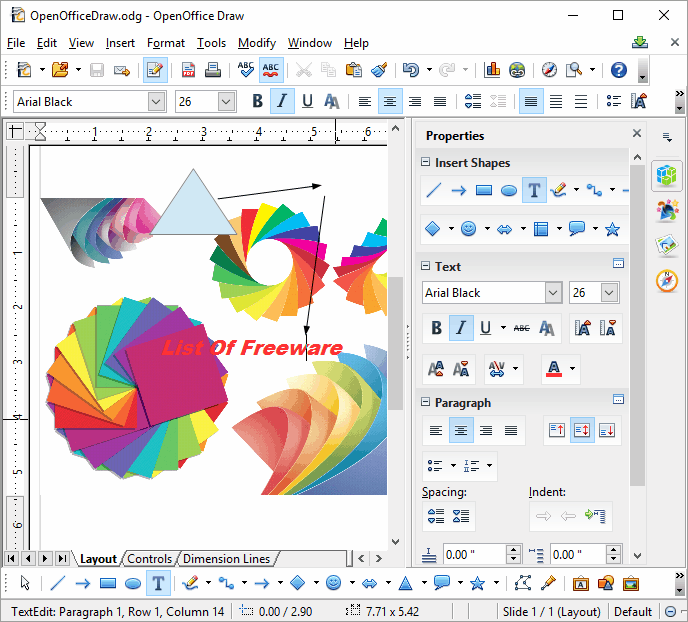 LibreOffice Draw is a part of free and open source office suite, LibreOffice. This is a cross platform software and is available for Windows, Linux, and MAC. You can easily use it to edit EPS files on your computer. There is a huge collection of editing tools, which you can use to apply various effects on your EPS file. Some of the tools available are: selection tool, fill tool, color tool, shape tools, connector, free hand drawing, etc. You can add text with formatting options and insert slides, media, chart, objects, etc. Open: text doc, spread sheet, drawing, web page, jpg, png, svg, tga, odt, ott, etc. Save as: odg, otg, and fodg. Export: gif, png, tif, bmp, eps, ppm, svg, wmf, pdf, etc. This EPS editor is available for Windows Vista, Windows 7, Windows 8, and Windows 10. View tools: Grayscale, color, black & white, grid, comment, and navigator. hyperlink, table , pictures, etc. Modify tools: Rotate, flip, convert, arrange (bring to front, bring forward, bring backward, send to back), alignment(left, center, right, top, bottom, center), group, ungroup, etc. After you edit EPS file, you can save them as: odg, otg, sxd, and std. Export options are: export > bmp, emf, eps, gif, png, ppm, svg, wmf, xpm, and pdf. 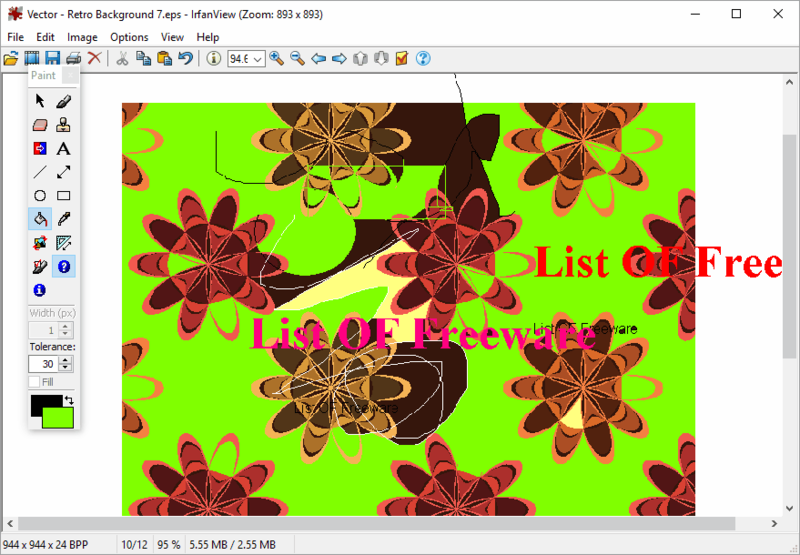 IrfanView is a free image viewer, where you can easily edit EPS files. The editing tools available here are not vector editing tools, but simple image editing tools. This freeware stands good if you want to make minimal editing to your EPS file. Selection, Paint, Eraser, Clone, Text, Objects, Color Picker, Flip, Rotate, Crop, Watermark, etc. tools are available to edit images. Open an Image, and press F12 to access the editor menu. After editing, your image cannot be saved as eps, but only as jpg, png, ico, gif, emf, pdf, tga, tiff, pbm, etc. XnView supports a wide range of image formats, which includes EPS as well. This software also lets you edit EPS files with very few options. These tools mostly include filter effects and few transformation tools. Filters: Blur, enhance, edge, sharp, emboss, slice, tile, mosaic, etc. Transformation tools: Rotate, flip, resize, crop, etc. You can also add text and watermark to your EPS file. It supports a lot of image files, but can only save in limited formats. Eps cannot be save in EPS format. Save your image as: bmp, gif, jpg, png, ico, dcx, pbm, pix, ps, raw, xbm, etc. Export options are: jpg, gif, png, tiff, bmp, pcx, tga, and jpeg2000. This version is only available for personal use. You need to buy a license to use it commercially. Photomania DX is another good EPS editor software, which is free for personal use. It has very few image editing options. These options only let you apply effects to your images, such as: enhance, contrast, brightness, color transform, temperature, sharpen, film grain, mosaic, shadow, highlight, etc. No transformation tools are available to alter shapes. 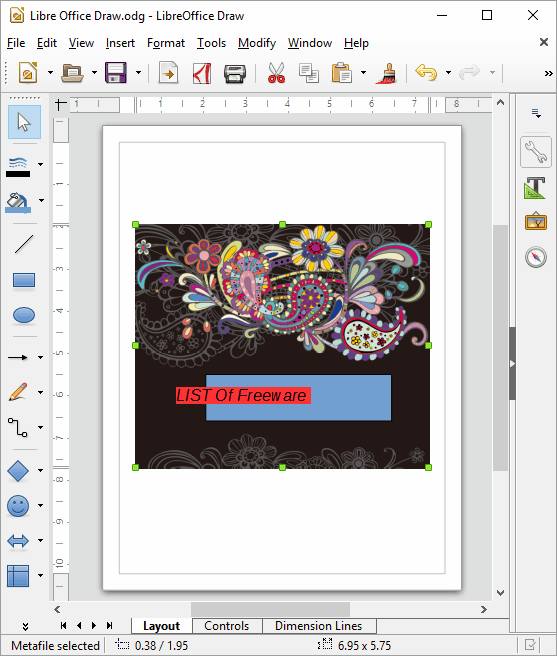 You can export your edited image as PDF, create PDF album, create HTML album, view slideshow, etc. Note that your files can’t be saved in EPS. Save EPS as: bmp, emf, gif, ico, jpg, png, psd, tga, and xpm.